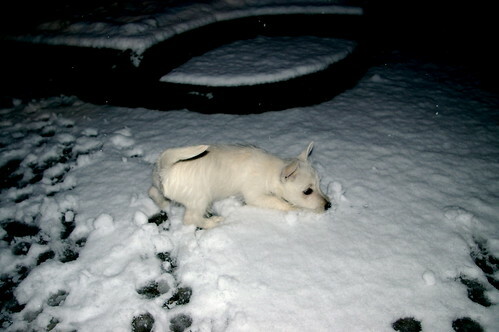 Our little monster, Monty had his first try out in the snow this morning. At first he was very wary but soon got over his fears and started to tunnel around the garden using his nose. He would bundle up a small roll of snow and then attack it. This repeated over and over for about ten minutes until I dragged him inside to dry off. The dog remains generally fearless and seems to take part in almost any activity with gusto, which is great to see. I think he even enjoyed his bath the other day, and now may be needing another.